View of the Powerscourt waterfall on the River Dargle, County Wicklow, Ireland. The waterfall is in the grounds of the Powerscourt Estate and is situated at the foot of the Sugar Loaf Mountains. The waterfall which is 425 feet high, is the tallest in Ireland. 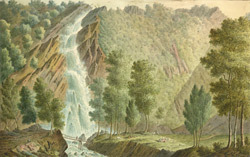 The Powerscourt waterfall has been a popular attraction since the mid 17th century but the area was originally settled by the Anglo Normans in the 12th century. The name Powerscourt is thought to have derived from a Norman knight Eustace le Poer, who was originally granted the land.